Embossed steel has an elegant, vintage look in this stonewashed gray finish rectangular accent mirror. A stone gray wash adds a vintage charm to the embossed steel frame of this chic, rectangular wall mirror. The flat-profile frame and its beveled mirror glass may be hung horizontal or vertical. Designed by Jim Parsons for Uttermost. 36" wide x 58" high x 1" deep. Hang weight is 38 lbs. Glass only section is 25" wide x 48" high. Surrounding frame is 6" wide. Beveled edge is 1/4" wide. 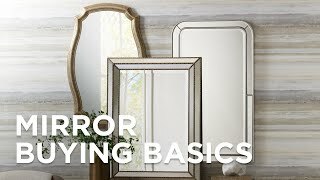 Embossed, flat-frame rectangular wall mirror designed by Jim Parsons from the Frazer collection by Uttermost. Stone gray wash finish. Steel frame construction.